Sponsored links are only visible to non-registered users. Registered users do not see any sponsored links. Registration can be done here . Google is responsible for selling Sponsored Links on EnglishForward. You buy Sponsored Links by buying Google Adwords and targeting EnglishForward. 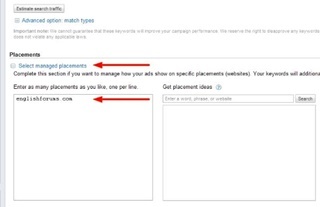 If you don't have a Google Adwords account, you can create one at https://adwords.google.com . If you already have an account, use the instructions below to target your ads on EnglishForward. Click the screenshots to enlarge them. 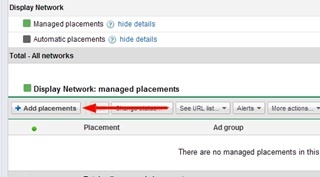 2) On the Campaigns page, choose an existing campaign (A), go to the "Networks" tab (B), and click the "Show details" link next to "Managed placements" (C). 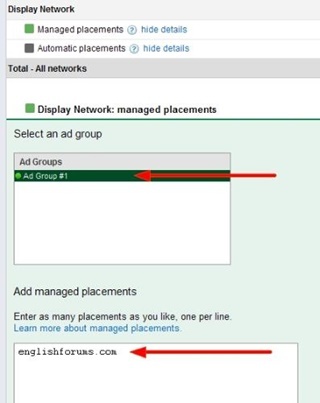 4) Select an AdGroup in the upper box, and add "EnglishForward.com" to the lower box. Click the Save button. 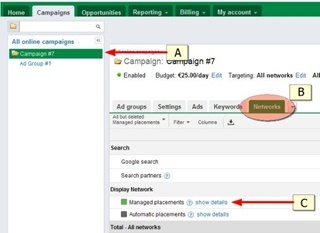 1) Log into your AdWords Standard Edition account at (if you're not already logged in). 2) On the Home page, find the "Create onlinecampaign" option in the "Active campaigns" box and click the "Placementtargeted" option in the drop-down. 3) Followthe wizard instructions to create your campaign. 5) Click "Save andcontinue to billing".